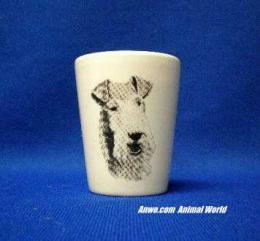 Fox Terrier T Shirt at Animal World® is Fox Terrier Lover fun. Featuring the multi-pose artwork this Fox Terrier T shirt is printed in USA on a light color 100% comfortable cotton in sizes S,M,L,XL,XXL, XXXL and Child sizes XS, S, M, L. Shop our Dog Breed T Shirts Store at Animal World® page for other dog breed T Shirts. Shop our Smooth Fox Terrier Gifts Store at Animal World® and Wire Hair Fox Terrier Gifts at Animal World® pages for additional Fox Terrier dog gift items.